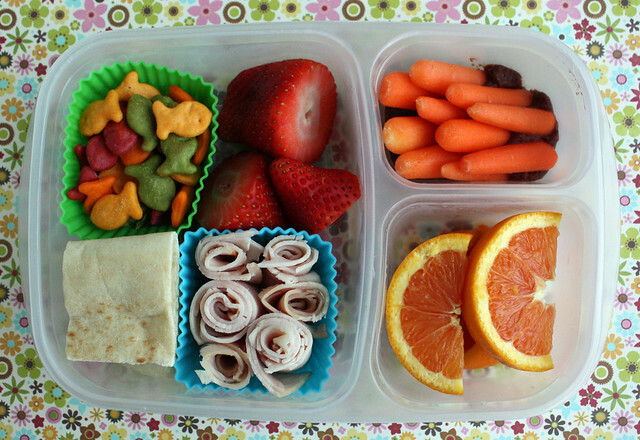 Here are the lunches I packed for the boys this week. We had Star Wars, kitties, and oranges. Exciting! The kids were off school for the MLK holiday on Monday so I didn’t pack any lunches. 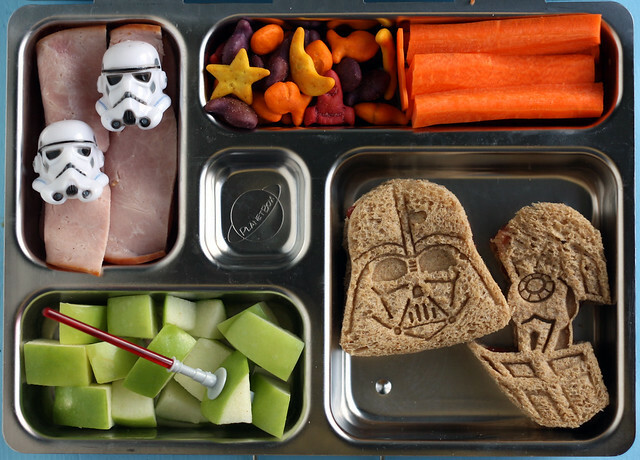 Tuesday’s lunches had a Star Wars theme. 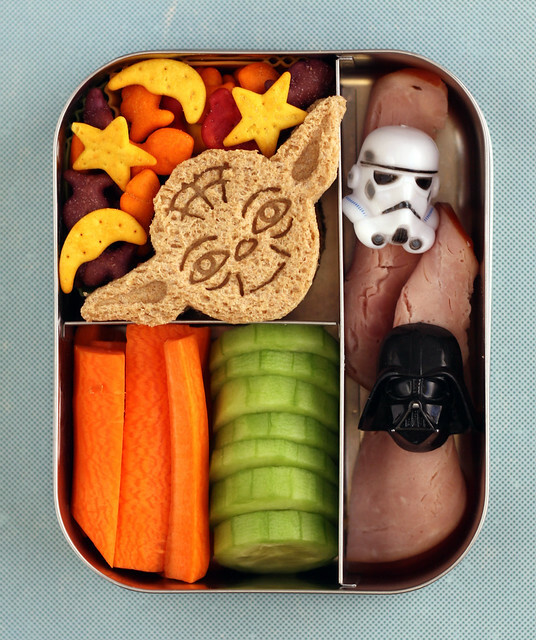 I packed Augie’s lunch in our Lunchbots Trio: space goldfish crackers, a pb&j Yoda sandwich (made with a cutter from this set), carrot “light sabres”, cucumber “moons” and a couple of pieces of ham that I slid through the loops in these Star Wars rings. Tip: Luncbots is having a sale on some of their boxes — including the one pictured above — until February 5. Wyatt’s lunch also had ham in the Star Wars rings, along with goldfish, carrots, Darth Vadar and tie fighter jelly sandwiches, and apple chunks that I speared with a light sabre pick. This was packed in our PlanetBox . 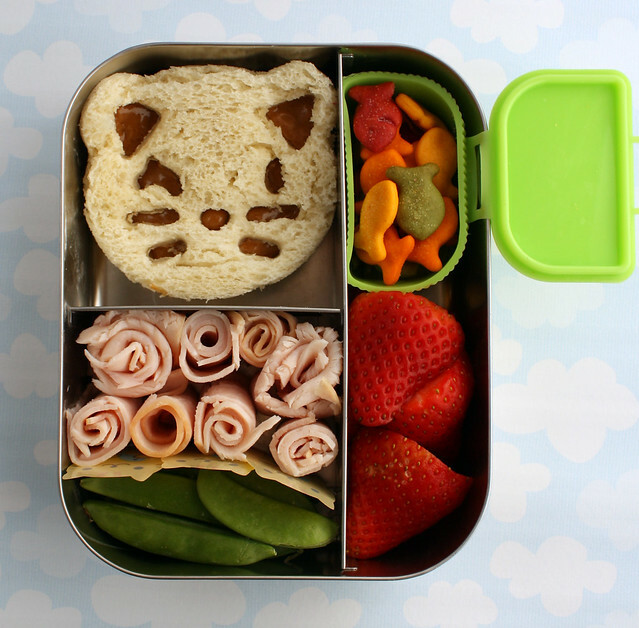 Augie has been playing with his stuffed kitties a lot lately, so I decided to make him this little kitty lunch. I made the pb&j cat sandwich with my Cutezcute set , then added in some cara cara orange slices, a few strawberries that I bought for an off-season treat and some sugar snap peas to fill in the last little gap. I used some cute animal food dividers to separate the fruit from the peas. This was packed in our full-size Steeltainer box. 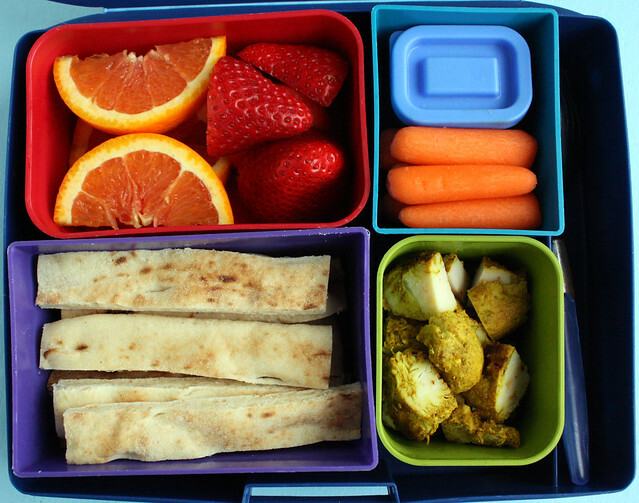 Wyatt’s lunch was packed in a Laptop Lunches box: cara cara oranges, strawberries, carrots with black bean dip, leftover curried chicken from dinner and strips of garlic naan. 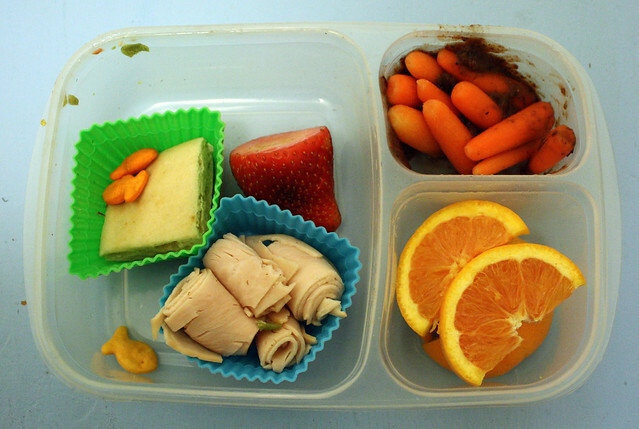 On Thursday the boys both got brightly colored lunches. Augie’s was packed in our London bus bento. 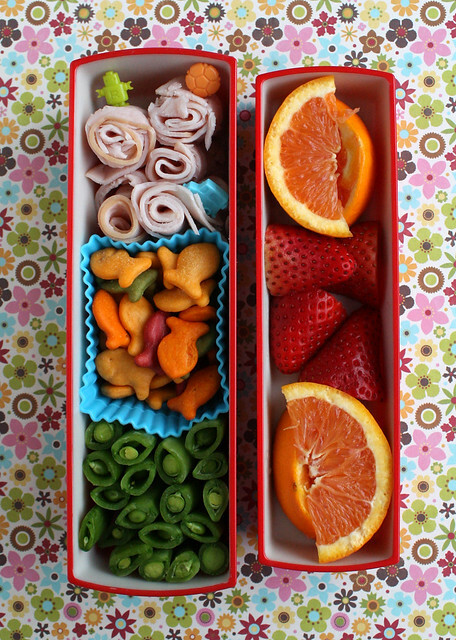 He had turkey roll-ups on boy toy picks, rainbow goldfish crackers, sugar snap peas, oranges and strawberries. Wyatt’s lunch was pretty much the same, but I swapped carrots and bean dip in for the peas and added some squares of naan. This was packed in our EasyLunchboxes box . It was one of those days when he barely ate anything. I also remembered why putting the dip on the bottom of the container with the carrots on top is a bad idea. Messy! 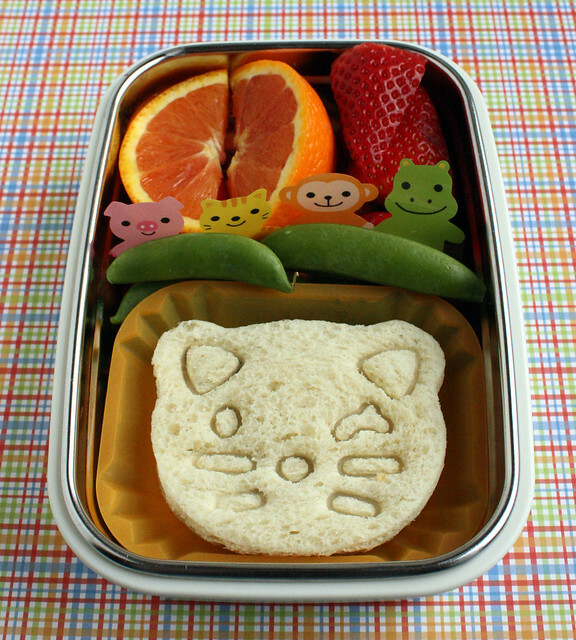 Augie asked for another kitty lunch today, so I used the CuteZCute again, but this time I cut the face out instead of stamping it. He also had some goldfish in a little suitcase cup (for the kitty to eat, strawberries, turkey roll-ups and snap peas. Wyatt had bean dip, carrots, strawberries, a tiny bit of leftover bbq-ed chicken, garlic naan, and a striped apple. 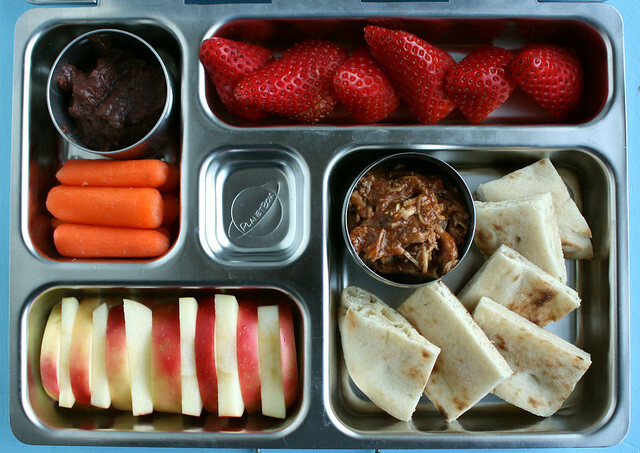 What was in your lunch box this week? Come join in on the fun we’re having on Facebook by likeing the Wendolonia Facebook page!